The weather was a little unstable at the beginning of the week, but began to feel like a normal late June towards the end. We finished up with several days of warm sunshine that really cranked up the surface temps. 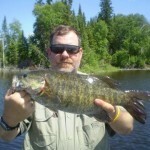 The result was a smallmouth bass bonanza. I am not talking about catching a few big bass. 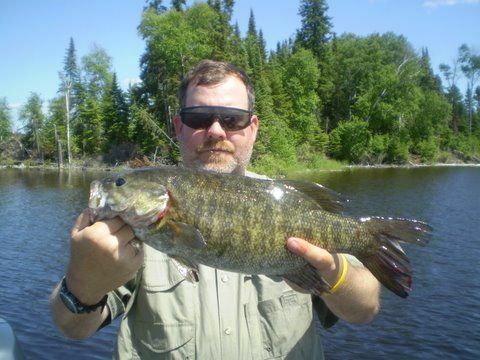 I am talking about 317 smallmouth bass over 17 in., Including 81 – 18s, 5 – 19s, and 1- 20. It was by far the best week of bass fishing that we have ever had. It helped that we had the right groups in camp. The Kendal Hartley / Mark Bailey group from Texas and the Garret Zoet group put the time in and the results were excellent. Good presentation was important, but specific baits were not. 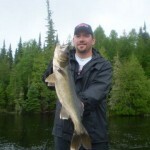 At times spinner baits, top water, tubes, ringworms, jigs and grubs, and crankbaits all caught fish. Weather, sun, and weed growth determined which worked best in specific areas and at different times. It is raining again tonight and the lake is as full as I have seen it in late June. The forecast is for up to 2 inches of rain over the next day and a half and that is going to make shorelunch beaches scarce to non-existent. 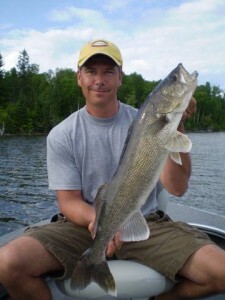 The week began with a tough, unpredictable walleye action and then turned into a “back to the good ‘ole days” solid June Walleye bite. By the end of the week, Daily guide sheets averaged between 30 -35 walleyes over 18 in. per boat. The highest daily total was 80 and it should be noted that many groups were still spending at least half their fishing day on bass. As a guide, it felt so good to be able to predict a bite that actually worked. It was like a switch was flipped. Earlier in the week, we scrambled to put a pattern together, but nothing worked. 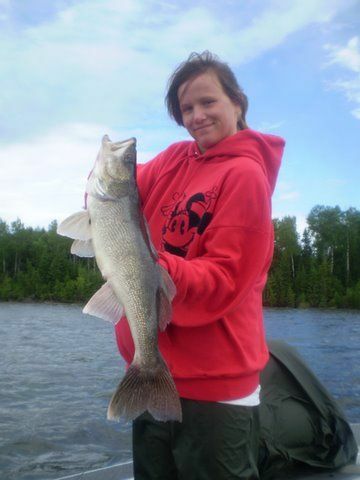 After several days of hot sunshine, a little bit of weed growth, and a little bit of experimentation, we once again found numbers of big walleyes “where they were supposed to be.” For the week we had 20 walleyes over 27 in., including 5 – 28s, 3 – 29s, and 1 – 30. Even with the sunshine, there was very little production pitching jigs shallow. 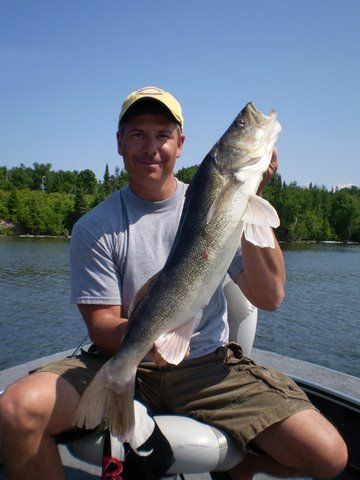 Most walleyes were caught between 7 – 15 ft. on transition structure. Weed growth is new and not even close to the surface, yet on bright flat calm days, many fish were caught on the deep side of the weeds. Jigs in 1/8 – 1/4 oz. 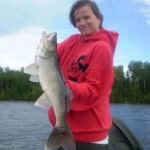 tipped with minnows caught most of the walleyes this week. 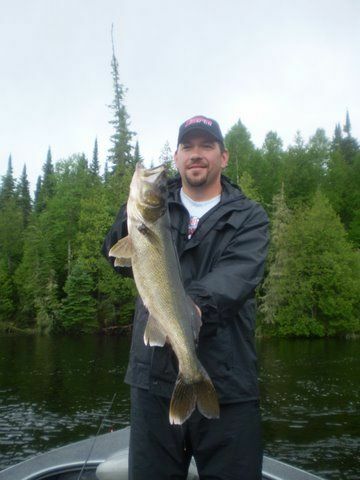 Between the return of the walleye bite and the Big smallmouth bass bite, zero effort was focused on Pike fishing. 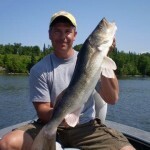 This is the first fishing report of the year that I was really excited to write. I cannot over emphasize the importance of weather on the immediate “bite”, but even after 20 years, it is still amazing to me how quickly the weather can affect an entire population of fish at once.